Hi crafters! Today I am going to show you how easy it is get a nice watercolor look using the Dare 2B Artzy premium inks. 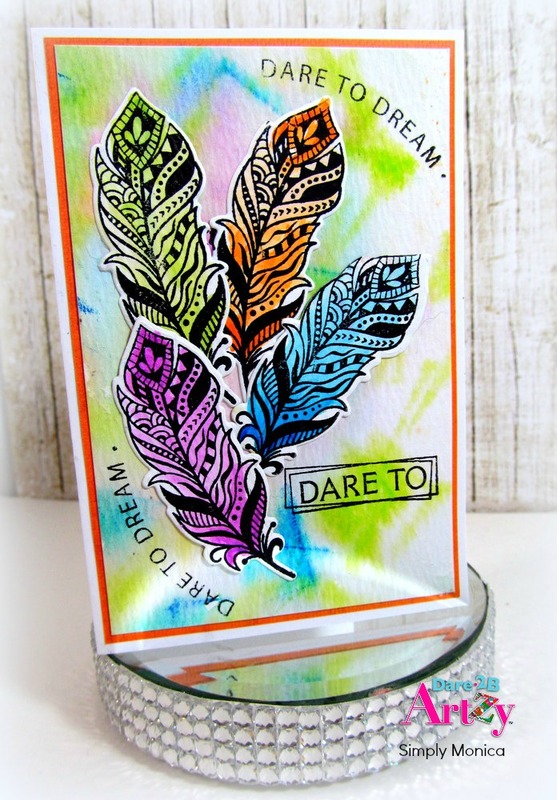 I will be using my Dream Catcher stamps set along with the matching dies to make my card. First, I took waterbrush pen from Derwent along with inks from the Tropical and Festive cube sets to watercolor with. I stamped 4 of the feathers from the stamp set and stamped them onto watercolor paper. Once I was done I then used the matching dies and diecut each of the feathers out. If you want to add some color to your background paper you can spritz some water onto your paper and use your waterbrush to create a watercolor looking background even. Just push the water out as you touch the tip directly to you watercolor paper and watch the ink float along the paper. I hope everyone enjoyed my post and be sure to come back and see all the amazing creations for 2017 from the Dare 2B Artzy team and don't forget their challenges! !to see more tutorials and videos be sure to visit my blog: Simply Monica thanks for having me!